IsoAcoustics is a proud Canadian company with head office in Markham, Ontario, founded by Dave Morrison, who was closely involved in planning and building radio and television studios at the Canadian Broadcasting Corporation for close to 20 years. The company has been manufacturing and distributing isolation stands for speakers and studio monitors since January 2012. Based on patented designs, there are currently three series of stands designed for the Professional Audio and home project studio, the HiFi and consumer market, and the large applications that include Pro Audio, HiFi and Live sound. In this relatively short period of time, IsoAcoustics has grown rapidly and now sells in over 60 countries. The ISO-L8R Series of speaker stands provide superior acoustic isolation and enhance the sound clarity of any speakers including studio monitors, home theatre systems and sound reinforcement. They are built with a unique, patented isolation technology that allows your speakers to “float” in free space, letting you hear authentic, uncoloured sound. 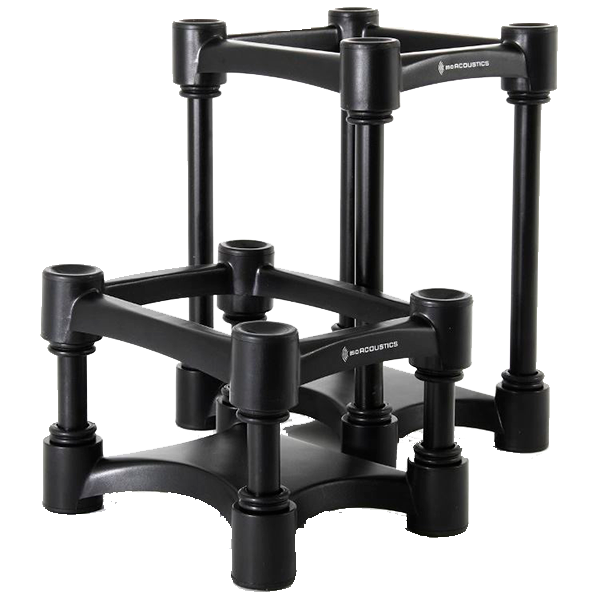 These ultimate speaker stands effectively eliminate energy transfer to surrounding surfaces. Bass becomes tighter, overall imaging is enhanced and your speakers perform to their full potential. Utilizing the height and tilt adjustment allows you to raise and tilt your speakers so your tweeters are always at ear level and positioned for best performance. Whether you’re a pro mixing in the studio, a musician creating in a home project environment, or an audiophile who appreciates every nuance of music and sound, you’ll hear and appreciate the difference with the ISO-L8R Series audio speaker stand. It’s simply the best investment you can make for superior audio. The ISO-L8R 155 fits most 5” two way studio monitors. Choose the ISO-L8R 130 for 4” or smaller speakers or the ISO-L8R 200 for 7”-8” two way systems. There are options for larger three way systems as well. The ISO-PUCK’s provide an innovative new approach in isolating studio monitors, guitar amps and other systems. This unique design provides a high degree of isolation while resisting lateral movement and oscillations, which results in greater sound clarity and focus. Possibly the most versatile isolation tool available for the studio, live stage or home as you can place them as needed to improve the clarity and performance of your pro equipment and monitors. This low-profile design makes the ISO-PUCK the ideal solution for studio monitors placed on meter bridges, floor stands, consoles, desktops, millwork, or soffit mounted. The ISO-PUCK decouples studio monitors from the supporting surface to eliminate the transfer of energy and the resulting sound smearing and coloration. Even studio monitors placed on the most solid steel stands, millwork or heavy granite surfaces will greatly benefit from the ISO-PUCK’s as the internal reflections coming back up from the supporting surface are attenuated to eliminate the smear and provide greater sound clarity and open up the stereo image. If more height or tilt is required, please see the ISO-L8R Series of isolation stands.